At its peak, one of these fungi sold for $79,000. We covet the unattainable. This, in essence, explains the hefty prices tagged onto the fungi in this list. Unlike the supermarket varieties, the mushrooms listed are virtually impossible to farm. There have been instances where farmers have managed to cultivate small batches of truffles — Ian Purkayastha, affectionately known as the "Truffle Boy" has managed to grow some in his farm in Fayetteville, North Carolina — but the demand for these elusive mushrooms have steadily increased through the years, keeping the prices high. Here are some of the priciest mushrooms around. 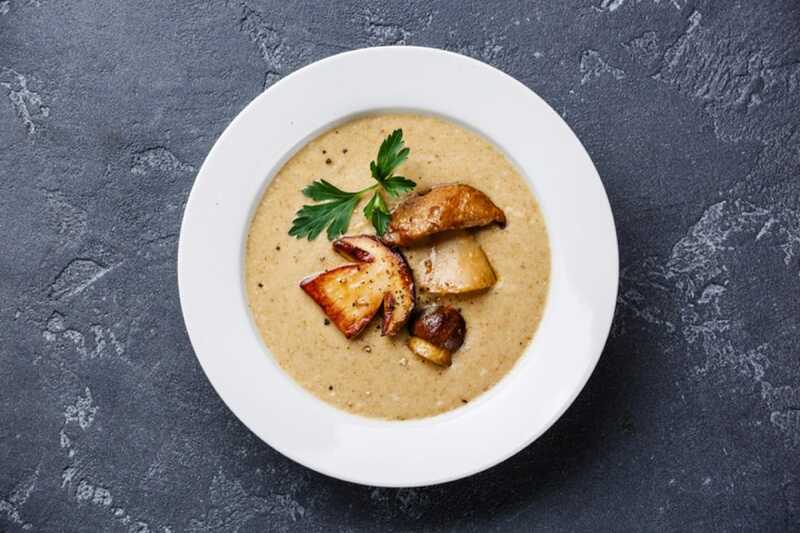 Porcinis blended into soups captures the robust earthiness of the fungus beautifully. It's a meaty mushroom with a robust, heady aroma. The term "porcini mushroom" technically refers to several different species but the most sought after of the lot is the Boletus edulis, or the king bolete, which is usually the mushroom people refer to when they say porcini. This prized fungus translates to "piglets" in Italian and are found on the ground of hardwood forests among threes of pine, chestnut, hemlock and spruce. Unlike the common variants found in the supermarket, porcini are mycorrhizal. This means that because of its complex relationship with its surroundings, porcini mushrooms are not easily cultivated. 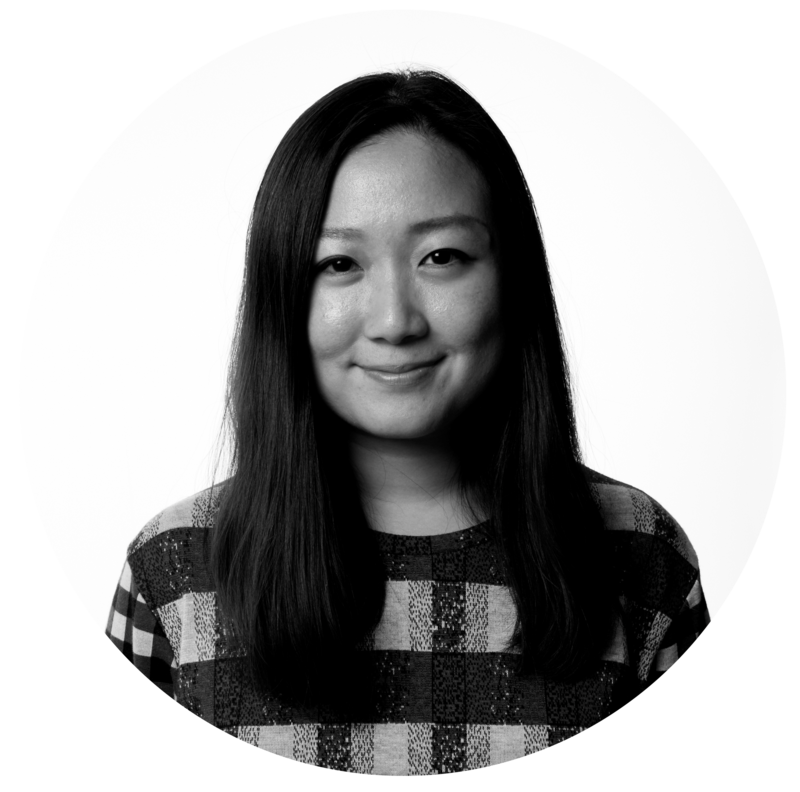 Thus, depending on where you live they could be hard to find fresh and more expensive to purchase. 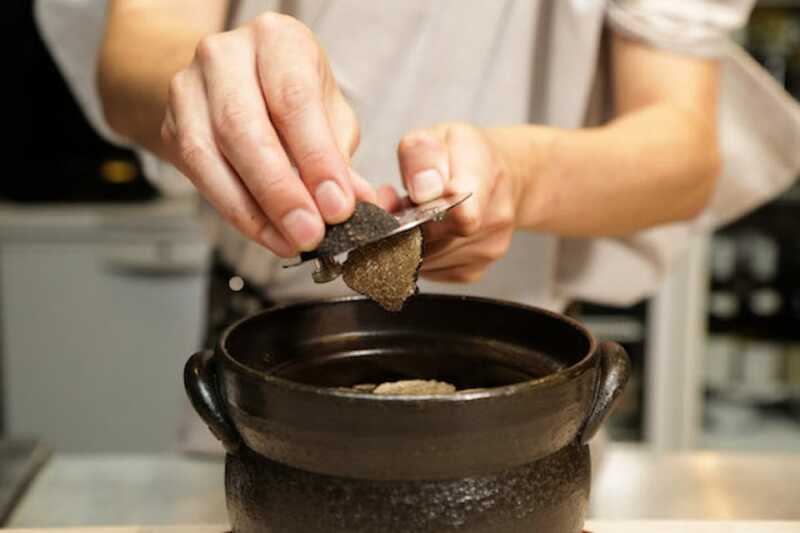 Black truffle shavings over Kamoshita's seasonal sea bream claypot rice. French epicurean Brillat-Savarin famously declared them the 'diamond of the kitchen'. Truffles are so prized for its deliciously earthy and distinct aromas. And like porcinis, black truffles are mycorrhizal, which means they're truly finicky organisms that grow only when the pH, moisture and mineral levels of a soil absolutely perfect. This delicate growing conditions coupled with a the fact that a trained furry pal (farmer's are ditching truffle-hunting pigs for dogs due to the unpredictable nature of pigs and having to pry damaged truffles from the mouths of the pigs) makes them the exclusive delicacy it is. 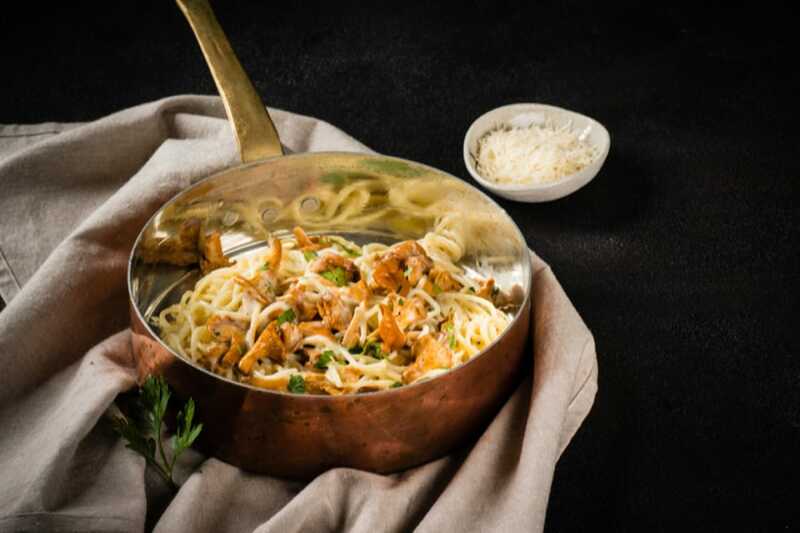 Chanterelle mushrooms lightly toasted in a pan then tossed in a tangle of pasta, herbs and cream. They grow in clusters in mossy, coniferous forests as well as in the grass among low-growing herbs. In central Europe, including Ukraine, chanterelles are often found in alpine forests among the European beech trees. They come in a variety of colours such as orange, yellow and white, but the most popular of the three are what the gourmands call 'golden chanterelles', which is almost fruity to the nose but with a spicy bite. While it's easy to identify and harvest chanterelles — the fungus have a smooth cap and distinct gill-like ridges that run from the bottom of its cap down its stipe — the fungus requires rather exact conditions to grow. Drenching rain followed by a couple of days of stifling heat is the best natural sauna they require to spawn, which explains why they only crop up towards the end of spring and disappear come autumn. 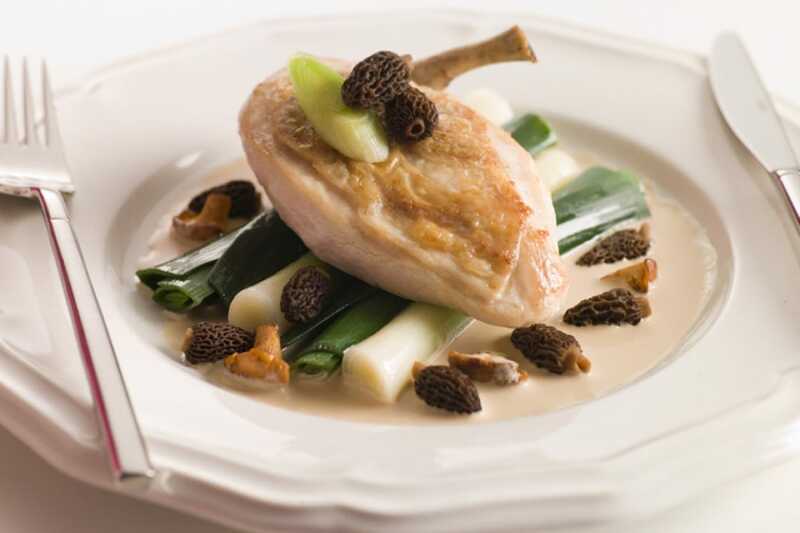 Poached chicken breast atop a bed of baby leeks and showered with morel mushroom heads. To date, the ecology of morel mushrooms, or morchela, remain a mystery. Each species of the morel seems to have its own relationship with nature and its surroundings. Yellow morels are more commonly found at the foot of deciduous trees while black morels are usually discovered found in coniferous forests, on the disturbed grounds of recently burned areas. And the blushing morel has the tendency to sprout in the colder months compared to the typical morel fruiting season of spring. Tree species associated with Morchela also vary tremendously, depending on the individual species, continent and even region. Despite the difference in their environment, the different species bear similar physical characteristics. Morels come with a distinctive honeycomb-like cap, which is soft and spongey in texture. And due to difficulties in cultivation and complications in commercial harvesting, wild morels are a multi-million-dollar industry. The Japanese are said to have enjoyed eating them since ancient times. Clay statues depicting matsutake were found in ruins from the Jomon Period (from 13,500 years ago to about 3,000 years ago). Also known as red pine mushrooms, matsutake has a home range that includes Japan, Korea, northeastern China and southeast Russia. 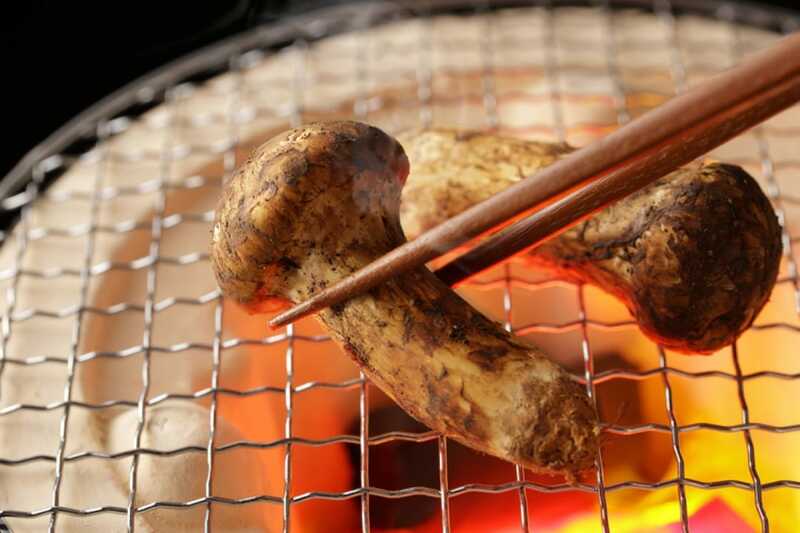 There are several species of matsutake mushrooms that can also be harvested from Canada, Norway and United States, just to name a few, but the most highly coveted variant is the one primarily harvested at the roots of specifically red pine trees. This year, due to a dismal harvest, the price of matsutakes peaked at $618 a kilogram. The fungus can be distinguished by its dark brown cap and a plump white stem and is lightly cooked, seasoned and consumed just days after its harvest. Four thousand dollars for a kilogram might seem like a lot to pay for a mushroom but it sells. Enter the white truffle, the even more luxurious, extravagant sibling of the black truffle. What makes the white truffle so much more prized? The white ones are only available a couple of months a year and are almost exclusively harvested from two main parts of Italy - Alba and Asti. 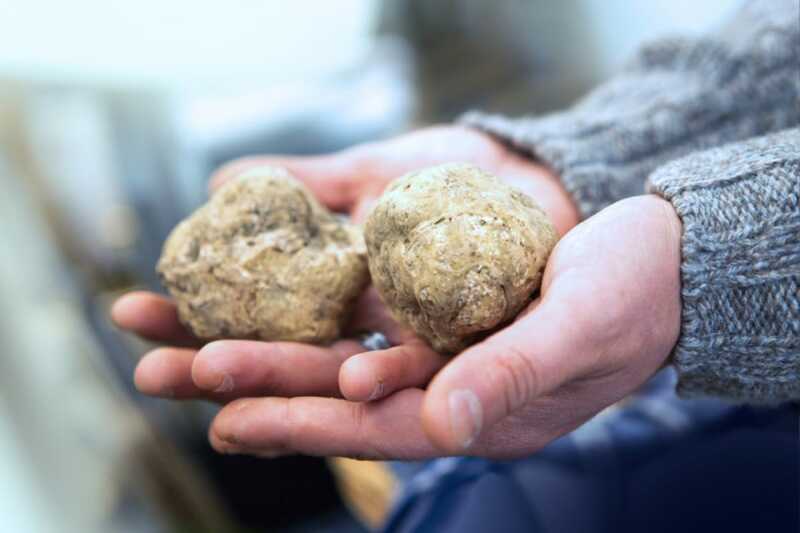 Like black truffles, white truffles require very specific conditions to thrive, a trained four-legged hunter and a cold snap for the biggest, ripest, most aromatic nuggets to grow. Black truffles are confined to summer with the harvesting done in a lovely, warm climate and beautiful damp soil. White truffles on the other hand, are harvested in the dreary cold. And while wet summers and autumn are a disaster for Italy's winemakers, the downpours are most beneficial for pungent white truffles, which grow hidden at the base of oak, beech and hazel trees. When all the events align, a fungus that's even more alluring and pungent than the black truffle emerges that gourmands are willing to shell out top dollar for. Earlier this month, a Hong Kong buyer forked out $119,000 for three Italian white truffles in an annual charity auction and in 2014, a single giant white truffle sold for almost $79,000 at a New York auction.